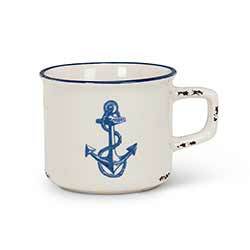 Everything beach, ocean, or nautical related, for home decorating, gift giving, and seasonal displays. Quilts, curtains, tabletop linens, pottery and dishes, resin figurines, signs, accessories and more by suppliers such as DII, Park Designs, Transpac, Mud Pie, Certified International, Primitives by Kathy, Abbott Collection, Blossom Bucket, and more! Adirondack Embroidered Dishtowel, by DII. 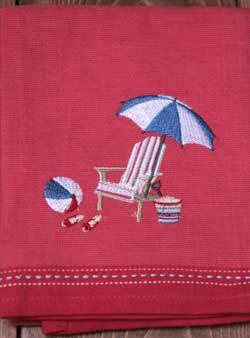 This pretty coral colored dishtowel features a summery embroidered image of adirondack towel, beach ball, and umbrella! Part of the Coastal Collection. 100% cotton. Machine washable (see label for care instructions). American Coast Braided Jute Trivet Set, by Capitol Earth Rugs. 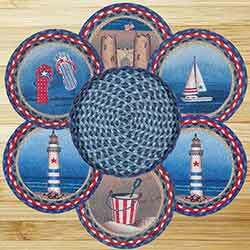 This trivet set includes the six round mats shown, with stenciled artwork featuring coastal, nautical scenes. Braiding is in red and nautical blues. Artwork designed by Sandy Clough. Comes in a matching basket. Trivets measure 10 inches in diameter. 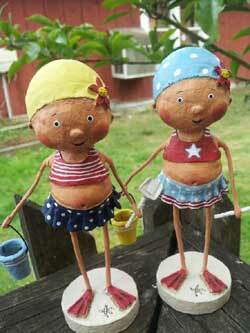 Made of jute. 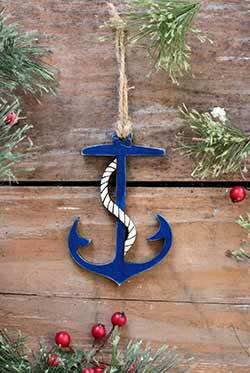 This anchor ornament is a unique gift for the nautical lover, the perfect accent for an eclectic Christmas tree, and a fun stocking stuffer! 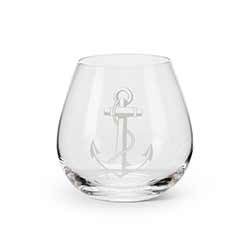 This large capacity stemless goblet is adorned with anchor icon for nautical flare. 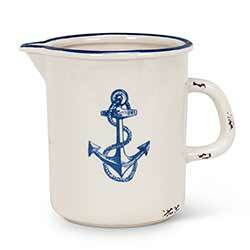 Great for a boat or beach house! Sold as a set of 4 glasses. 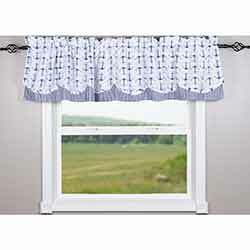 Perfect for a nautical room, this Valance features red anchors appliqued onto a boat striped background of nautical blue and white. 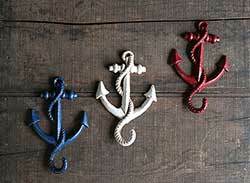 Anchor Wall Hook, custom hand painted in the USA! 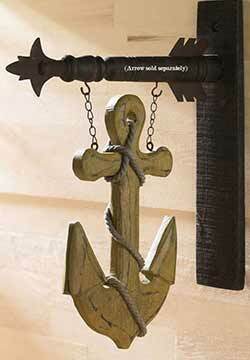 Add a unique bit of vintage style nautical decor to your wall with this cast iron anchor wall hook! 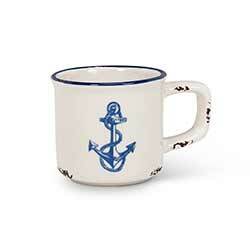 Adds a nautical look to any room! Features layers of cotton fabric - gently scalloped white cotton with anchor print in navy blue, over top white and blue stripes with staright edge. 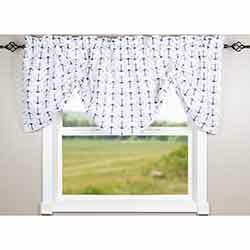 This nautical style valance features an anchor print in navy blue against white cotton fabric, with two drawstrings for creating the gathered scallops. 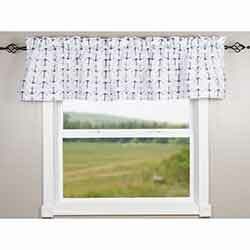 This nautical style valance features an anchor print in navy blue against white cotton fabric. 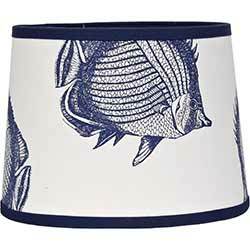 Great for a tropical or beach home decor look, this lamp shade features a blue angel fish image printed on a white cotton base with cobalt blue trim.. This is for the 14 inch size. 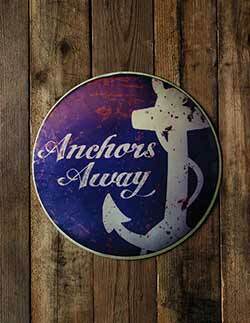 Great for nautical decorating, this purple metal sign fears an antiqued anchor image, and reads: Anchors away. Arielle 36 inch Beach Table Runner, by VHC Brands. Decorate your seaside cottage with this beach table runner! Features aqua blue shells, seahorses, and coral printed on white woven cotton, in the 36 inch length. Arielle 48 inch Beach Table Runner, by VHC Brands. Decorate your seaside cottage with this beach table runner! Features aqua blue shells, seahorses, and coral printed on white woven cotton, in the 48 inch length. 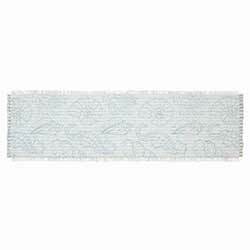 Arielle 72 inch Beach Table Runner, by VHC Brands. Decorate your seaside cottage with this beach table runner! Features aqua blue shells, seahorses, and coral printed on white woven cotton, in the 72 inch length. 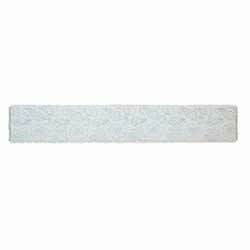 Arielle 90 inch Beach Table Runner, by VHC Brands. Decorate your seaside cottage with this beach table runner! Features aqua blue shells, seahorses, and coral printed on white woven cotton, in the extra long 90 inch length. Arielle Beach Christmas Stocking, by VHC Brands. 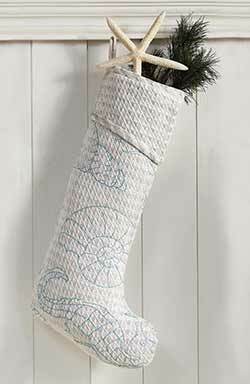 Decorate your seaside cottage with this beach Christmas stocking! Features aqua blue shells, seahorses, and coral printed on white woven cotton. Arielle Beach Extra Long Stocking, by VHC Brands. Decorate your seaside cottage with this beach Christmas stocking! Features aqua blue shells, seahorses, and coral printed on white woven cotton. Extra long, for extra goodies! Arielle Christmas Tree Skirt, by VHC Brands. 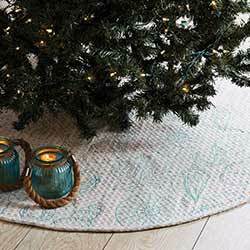 Decorate your seaside cottage with this beach Christmas tree skirt! Features aqua blue shells, seahorses, and coral printed on white woven cotton. Welcome the easy breezy style of coastal living with this hand lettered, reclaimed wood beach sign! 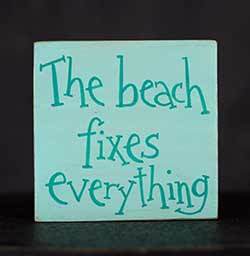 Add this little sign to your beach decor in your bathroom, living room, or anywhere you need a little coastal inspiration. 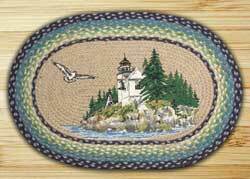 Bass Harbor Braided Tablemat, by Capitol Earth Rugs. Artwork by Harry W. Smith. 100% natural jute, dyed and braided, featuring stenciled artwork in the center. This is for the ROUND Tablemat, which measures 10 inches in diameter. 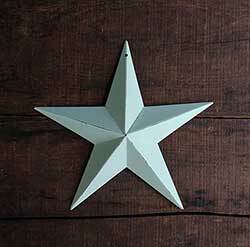 Use as a trivet, centerpiece, or smaller sized round placemat. 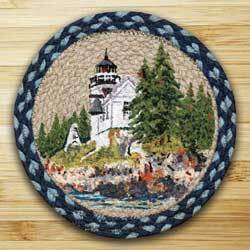 Bass Harbor Oval Patch Braided Rug, by Capitol Earth Rugs. Artwork designed by Harry W. Smith. Measures 20 x 30 inches. Made of 100% natural jute. Beach Arrow Art Tile, by En Vogue. Measures 3 x 16 inches. Made in the USA. This beautiful artistic tile is hand-painted and high-temperature kiln-fired with brilliant colors, glass-like shiny glaze, and embossed relief-like texture. Can be hung on a wall or placed on an easel, indoor or outdoor. Can also be used as a hot plate. Backing can be removed by soaking and water, then installed like a regular tile. Wide variety of images available! 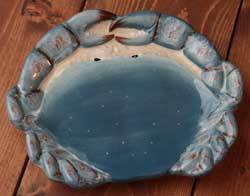 Beach Cottage Crab Plate, by Certified International. Lovely ocean-inspired ceramic dishes in a soothing color palette of neutral sands, ivory, and beach-glass-blue. Features artwork of sea birds, blue crabs, and red lobsters, by Susan Winget. This is for the Crab Plate. Measures 8 x 6 inches. 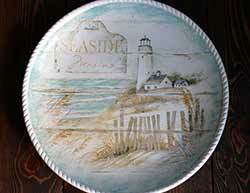 Beach Cottage Round Platter, by Certified International. Sand, white, and beach glass blue colors. Lighthouse artwork by Susan Winget. 16 inch diameter. 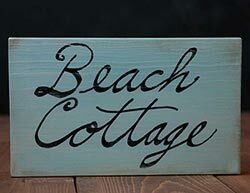 Beach Cottage Wooden Sign, by Our Backyard Studios in Mill Creek, WA. 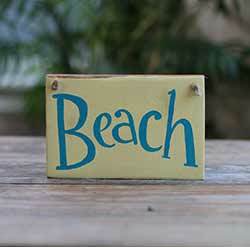 This hand-painted rustic beach sign is perfect for your ocean-inspired decor! Front is painted a light, beach-glass-aqua-blue color, sanded and rubbed back to reveal some creamy white underneath. Sides are painted creamy white, and the whole sign has been glazed with some touches of brown to give it an antiqued look. Beach Distressed Wood Sign, by Our Backyard Studio in Mill Creek, WA. This little sign is perfect for a small wall space, office area, ornament, or hanging from the center of a wreath! Lettering is charcoal grey, background is a very light beach glass blue. Beach Fixes Everything Sign / Shelf Sitter, by Our Backyard Studio in Mill Creek, WA. 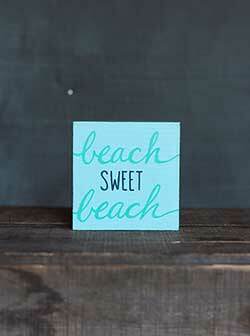 Add a coastal touch to your office desk, wall, or shelf with this hand-lettered beach sign! Beach Glass Blue Star, custom hand painted in the USA, in your chosen size! This is for the Beach Glass color, a pale and watery shade of light robin's egg blue, perfect for a beach cottage or vintage chic style. 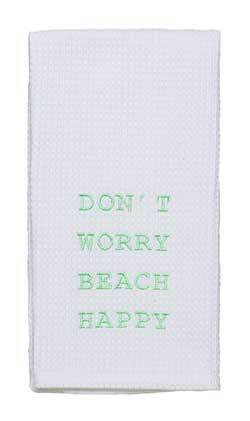 Give your kitchen the carefree, breezy feeling of beach living with this set of embroidered dishtowel! 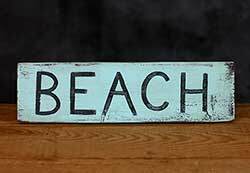 Display your passion for beach life with this hand painted wood sign, perfect for any coastal inspired room or home by the sea! Beach glass blue color. 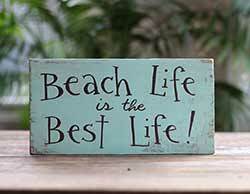 Take the beach with you to any room in your home or office with this little wood sign! Hang in a small wall space, in the center of a wreath, set on a shelf, or give as a gift to the beach lover in your life! Painted on an old scrap piece of pine, this small sign features free-hand lettering in turquoise and black against a beach glass blue background, and lightly edged in black. Reads, simply: "Beach Sweet Beach." Lend seaside charm to a bedroom, hallway, bathroom, or kitchen with this cast iron octopus hook, painted a distressed green color. 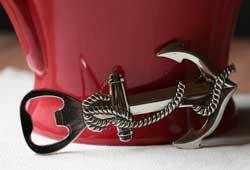 Add a nautical touch to a bedroom, hallway, bathroom, or kitchen with this cast iron dolphin hook, painted a distressed green color. Add a touch of the coast to a bedroom, hallway, bathroom, or kitchen with this cast iron seahorse hook, painted a distressed blue color. Add a touch of the coast to a bedroom, hallway, bathroom, or kitchen with this cast iron seahorse hook, painted a distressed ivory color. 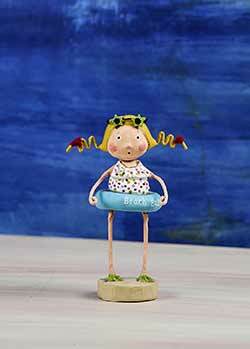 Perfect for summer or beach themed miniature displays, this wee mermaid is sleeping on a stone. Her tail is lightly dusted with glitter.